...powered by Espruino.com - designed by @Gordon Williams! Thanks! Unfortunately I wasn't allowed to share any information about this until they were given out to the conference attendees, but they're really exciting. There was a great response at the conference. These are the fabled 'Bluetooth Badges' that are going out to Patreon $20+ supporters as well (with a custom Patreon PCB). 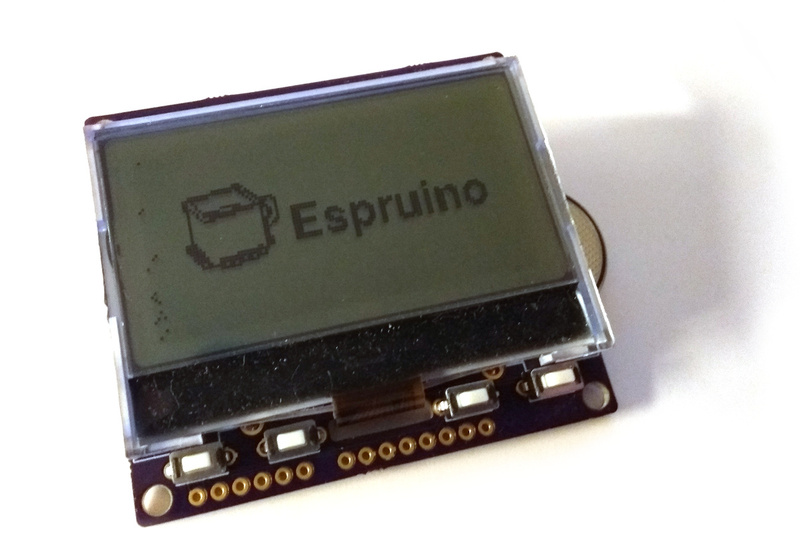 The response has been so good I'm in the process of making a new, proper Espruino device with an LCD that should be available for sale at some point early next year - it'll be set up as a smart display, but arranged so that you can clip it onto something to use as a badge if you want to! 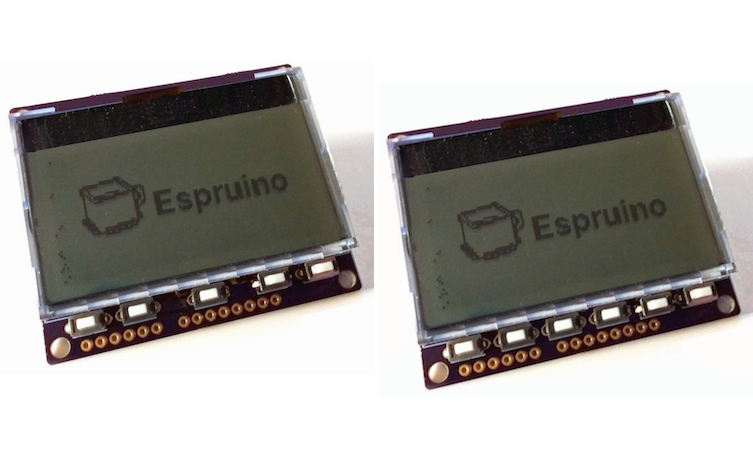 @Gorden, is power consumption of this new Espruino device the reason to select LCD over OLED? So nobody learned anything at NodeConf - too busy playing with their badges? I would have been. Very nice. @allObjects - yes. And size. It's hard to get affordable yet big OLED displays. Even the small 128x64 OLEDs use around 20mA when on - so that's 10 hours on a CR2032. The LCD uses 0.15mA, so it's plenty for a week of usage. Really? 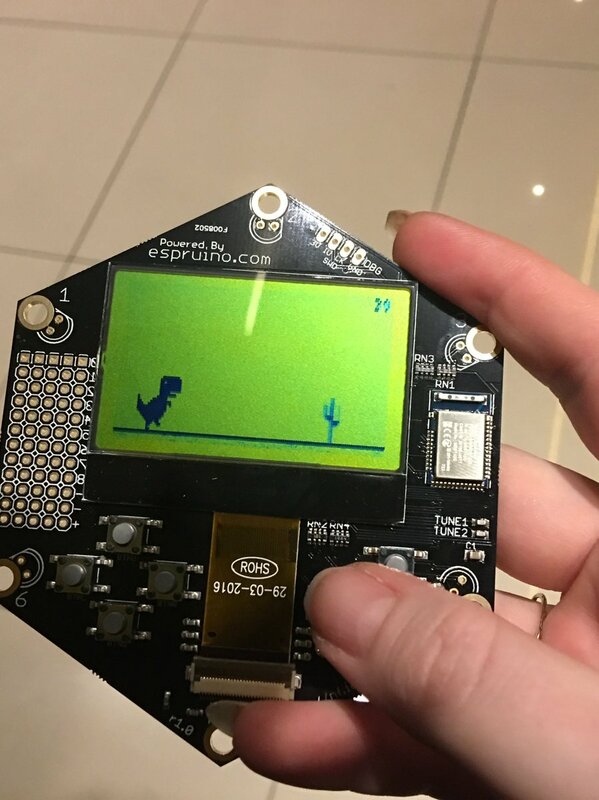 there are loads of GPIOs available on the chip - wouldn't it be confusing if a few extra pins were brought out that went up and down every time you accessed the LCD? As it goes, I'll probably end up using Arduino pinout I think - it fits really well around the LCD itself, and there are loads of super-cheap boards and getting started kits for it. MOSI/MISO/CD/RES can be shared in a SPI bus, just not CS - that was the thought behind my comment. But if you think there is plenty of other pins to populate the Arduino pinout, no need to share. The buttons are there precisely because there's space needed for the ribbon cable from the LCD, and I thought I could fill the gap on either side with something. Because I'm using the Arduino footprint I don't have space to move the LCD up (or flip it around) either, so I don't think there's really a way around having a gap there (I also don't have any spare IOs!). I probably won't actually pre-install the buttons (because of the cost involved in doing a two-sided board) and would just put two sideways facing buttons on the back of the board - but at least they're there if anyone wants them. What are everyone's thoughts about pre-installing the Arduino headers? It makes the whole thing more plug and play and beginner friendly, but adds to the cost and makes the whole device thicker than it would otherwise have been.